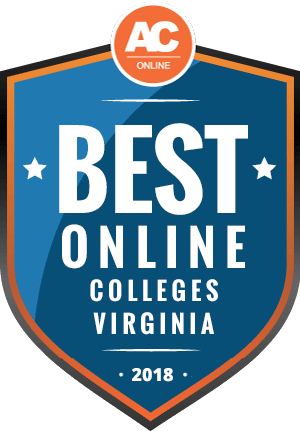 Why Choose Virginia for Online Higher Education? The demand for knowledgeable employees continues to increase demand for college-educated workers. In Virginia, 67% of employers require employees with some postsecondary experience, while 23% require a bachelor’s degree. However, 13% only consider candidates with an advanced degree. Additionally, the Bureau of Labor Statistics data (BLS) projects rapidly expanding occupations will require postsecondary education. With the growing availability of digital classrooms, students can earn an accredited degree from one of Virginia’s online universities, which can boost their earning power and marketability. Students can use this page to review important information and resources about the most affordable online universities in Virginia. To secure the best return on investment, students should consider multiple factors when selecting an online program. Our rankings consider the breadth of distance programs, student-to-teacher ratios, student resources, and job availability for graduates. This ranking emphasizes affordability, which includes average financial aid, the percentage of student who receive scholarships, and average tuition for full-time students. While Virginia students have access to numerous on-campus programs, many learners require flexible schedules that traditional environments cannot accommodate. In Virginia, over 83,000 students choose to complete their degrees exclusively online. Virginia’s most affordable and accredited universities allow underserved student populations and other unconventional students to earn a degree and boost their earning potential. The best online universities in Virginia offer global access to quality education. However, out-of-state and international students typically pay more. The data below reveals that, on average, nonresidents pay $9,670 more than residents at four-year public schools in Virginia, while two-year institutions charge out-of-state students over $6,000 more on average. Students should also note programs at schools with traditional campuses typically charge out-of-state tuition fees, while 100% online schools may charge flat rates for all students. However, out-of-state students may qualify for discounted tuition rates through regional exchange agreements with Virginia. Students may consider establishing residency to qualify for in-state tuition. The tuition at the best online institutions in Virginia exceeds the national average for all students attending public and private four-year schools. Rates for quality two-year programs also exceed national averages. Tuition rates vary by learning format. For instance, tuition rates for students attending classes on campus pay for housing, parking meal plans, and lab fees. On the other hand, online students often pay for software or tech fees for online coursework. The list below includes base tuition rates in Nevada. Virginia currently provides education to over 53,300 non-resident students. While Virginia schools charge out-of-state tuition, some participate in reciprocity agreements that make earning a degree more affordable for nonresidents. Virginia belongs to the Southern Regional Education Board (SREB), an organization that manages educational reciprocity relationships between multiple states. Through the SREB, affiliated schools allow nonresident students to enroll in programs that do not exist in their home state without out-of-state charges. In fact, Virginia saves about $1,900,000 each year. SREB member states include Alabama, Arkansas, Delaware, Florida, Georgia, Kentucky, Louisiana, Maryland, Mississippi, North Carolina, Oklahoma, South Carolina, Tennessee, Texas, Virginia, and West Virginia. While the SREB recognizes all public, private, and nonprofit schools in each state, students should note that schools retain the right to limit participation. The State Authorization Reciprocity Agreement (SARA) strives to make education more accessible to students. Schools affiliated with SARA have uniform standards and allow students to avoid unnecessary tuition costs. While a state may hold active membership, schools can choose not to participate. In Virginia, nearly 60 schools hold SARA approval. Students should note SARA covers individual classes as well as entire programs. Therefore, students may need to verify their program has full coverage. The section below contains commonly asked questions regarding online education in Virginia. Students should review these FAQs to gain a general understanding of how online programs operate. Do online credits cost more or less in Virginia? In general, Virginia residents should anticipate paying $13,370 on average for their bachelor’s degree. Schools that have brick-and-mortar locations often charge online students the same rates despite the learning environment. Strictly online schools often charge lower tuition because they do not pay the same overhead as brick-and-mortar schools. Some schools charge online learners less because they do not utilize the on-campus facilities. For instance, at James Madison University, residents can earn their bachelor’s degree for $7,250 per year despite the learning environment. However, Virginia State University residents pay $5,540 per year, while distance learners pay just $199 per local online course (LOOC). Full-time enrollment requires 12-18 credit hours. Even at 18 credits, LOOC learners pay well under $2,000 per year. Which Virginia schools accept the most transfer credits? Typically, students at two-year colleges may transfer up to 60 credits, while four-year institutions accept 90 credits maximum. Virginia belongs to the SREB, which exists to make education more attainable through bilateral and statewide agreements. In fact, only three states in the SREB, including Virginia, participate in the Interstate Passport, which approves the transfer of all lower level division coursework. Virginia students will find many community colleges partner with four-year institutions to ensure coursework can transfer easily. While most Virginia schools accept transfer credits, recent data released by the State Council of Higher Education for Virginia indicates the most welcoming institutions include George Mason University, Old Dominion University, and Virginia Commonwealth University. In fact, George Mason University accepts all transfer credits from regionally accredited schools. Old Dominion University evaluates all transfer credits and students may use the Monarch Transfermation system to view transfer impact. To view transfer agreements at all Virginia universities, students can use the Virginia Education Wizard to explore the transfer planning tool. Will any online colleges in Virginia accept a GED? Colleges and universities understand some applicants do not hold a high school diploma for one reason or another and will accept a GED. In fact, GED Testing Service indicates that 98% of colleges and universities accept a GED as a valid credential. Furthermore, American Council on Education data reveals that over 18 million people have earned a GED since the exam emerged, while 800,000 took the exam last year alone. The GED exam assesses the same content areas that high schools cover including language arts, reading, writing, mathematics, science, and social studies. In fact, GED Testing Service data indicates that only 60% of graduating high school seniors pass the test on their first attempt. General passing scores remain at 145 per section, while college-ready scores range between 165-174. In Virginia students must score 150 points at minimum on each section. How many academic terms per year do online colleges in Virginia offer? Most schools offer fall, spring, and summer enrollment dates. However, many students identify as nontraditional and require more flexibility. Therefore, colleges and universities now offer multiple enrollment dates to appeal to as many students as possible. Multiple start dates provide students with the opportunity to take courses at their leisure. While most schools do not offer weekly start dates, some Virginia programs offer start dates ever four to eight weeks. For instance, Virginia College strives to meet the needs of underserved populations and nontraditional students by offering one of the lowest tuition rates in the state, complete accessibility through 100% online courses, and five- to eight-week sessions at the undergraduate level. Headquartered in Henderson, Virginia, Stratford University offers five terms that require 10 weeks of study and students may take classes completely online or in a hybrid format. Other schools retain traditional semester structures but break courses into eight-week segments. Which online colleges will accept FAFSA in Virginia? The National Center for Statistics data indicates 85% of first-time college students during the 2015-2016 school year received financial aid. The Free Application for Federal Student Aid (FAFSA) exists to make higher education more attainable for all students. FAFSA works with schools that hold reputable credentials. Students should only consider regionally or nationally accredited programs. Students should also note that enrollment status impacts financial aid awards. Students must maintain part-time enrollment to qualify for any assistance. Furthermore, part-time students only receive half of what they could receive as full-time students. Financial aid provides different types of funding, including unsubsidized and subsidized Stafford loans, Perkins loans, grants, and work-study. However, many online schools do not accept work study. Additionally, institutions like the University of Virginia promote a no-loan policy to encourage less debt by setting a need-based income threshold. Are there any free online classes I can take from Virginia colleges? The University of Virginia offers over 50 online classes for free, though these courses do not award credits. Students majoring in business can take courses including foundations of business strategy, fundamentals of project planning and management, digital marketing, marketing analytics, advanced business strategy, personal branding, cost and economics in pricing strategy, or business growth strategy. Finance majors might consider finance and investment, financial accounting fundamentals, or data analytics. Students interested in technology and design can enroll in introduction to computer science, programming languages, applied cryptography, testing with agile, or customer-centric IT strategy. Meanwhile, humanities majors can take global history, Tibetan Buddhist meditation, or the age of Jefferson. Courses typically range from four to 12 weeks. Some classes allow students to move at their own pace. How can I find the online program options at Virginia’s colleges? Students searching for the best online schools in Virginia can look to the State Council of Higher Education for Virginia. They provide access to college preparatory information on their website. The site discusses pertinent information about what to look for in distance learning programs. The Virginia Department of Education also includes a list of approved schools throughout the state to help students avoid institutions without credentials. Students can also use the Virginia Gaining Early Awareness and Readiness for Undergraduate Programs (GEAR UP). This organization works directly with all higher education institutions to help students identify which programs best meet their career goals. The Virginia Education Wizard also helps students find the best education and career pathways. The site includes a course planner, transfer information, and career requirement details. This scholarship supports students with exemplary grades and financial need. Applicants must have attended a disadvantaged high school in Virginia and plan to attend a school in Virginia. Students may receive this scholarship for four years if they meet academic requirements. This scholarship requires students to write an essay about the history of two renowned generals. The essay must display thorough research and a strong thesis. Students may only receive this award once. Both Virginia residents and out-of-state students earning a bachelor’s or master’s degree at a two- or four-year institution in Virginia may apply. Applicants must prove financial need. Additionally, they must maintain full-time enrollment. Students may renew this scholarship each year if they meet academic and enrollment requirements. The Virginia Department of Transportation (VDOT) offers students real-world experience and paid summer internships on top of their award. For each semester students receive stipends, they must agree to work six months at the VDOT. Students who maintain over a 2.5 GPA qualify to receive this scholarship annually. African American high school seniors attending schools in Northern Virginia may apply for this scholarship. Students must retain a 3.5 GPA and enroll into an accredited Virginia college or university. Applicants must display leadership in their communities. This scholarship requires a 300-word essay.